Cthulhu : I can’t wait to watch this movie. I’m a huge fan of H.P. Lovecraft and wanted to watch this independent movie when it was in the theaters but due to it’s limited release I was unable to watch it. For more read here. 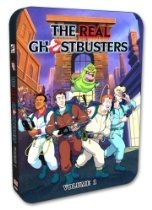 The Real Ghostbusters, Vol 1 : OMG we were just talking about this show on the Project: Shadow Informant. I loved this as a kid. I’m so excited to see it out. Dragonquest : I have not seen this one but it does have dragons in it for our fantasy fans. If you have seen this let me know in the comments if I should rent it. Vampire Secrets : A History Channel exploration into Hollywood’s vampires including a look at the origin of several common superstitions and reveals the connection between the ancient vampire myths of Europe, Greece and China. I haven’t seen this show but I like most of the History channel’s exploration specials. National Geographic: Journey to the Edge of the Universe : I love these shows the imagery of stellar objects are always breathtaking. Go on a voyage through the cosmos, beginning on Earth and traveling outward through the solar system and the Milky Way, past distant galaxies and to the very limits of the universe. Images from the Hubble telescope and innovative computer graphics make possible the single, long traveling shot that comprises this journey, and unobtrusive narration explains the sights along the way. Ogre: Yet another bad monster flick from the Sci-Fi channel. Not having watched this one yet I wonder if it’s just bad or if it passes into the realms of a craptastic B movie. If you have watched this let me know in the comments. For the Parents: two Goosebumps movies out this week for the young viewers. Goosebumps: The Scarecrow Walks at Midnight : This collection of spooky tales: In the title story, Jodie and Mark witness strange goings-on at their grandparents' farm. In "Don't Go to Sleep," Matt wakes up to find a family that he almost doesn't recognize. And in "Calling All Creeps," Ricky is paying the price for posting a mean girl's phone number in a personal ad. Goosebumps: Return of the Mummy : A trio of spine-chilling adventures: Gabe encounters an unhappily disturbed mummy while visiting his archaeologist uncle in Egypt in "Return of the Mummy." Next, Jeff gets a surprise when he receives a sarcophagus containing a 4,000-year-old mummy from his father. Finally, Eddie and Hat's plan to scare a boastful pal doesn't turn out the way they plan. Older PostWhere is the Diversity in IDIC?